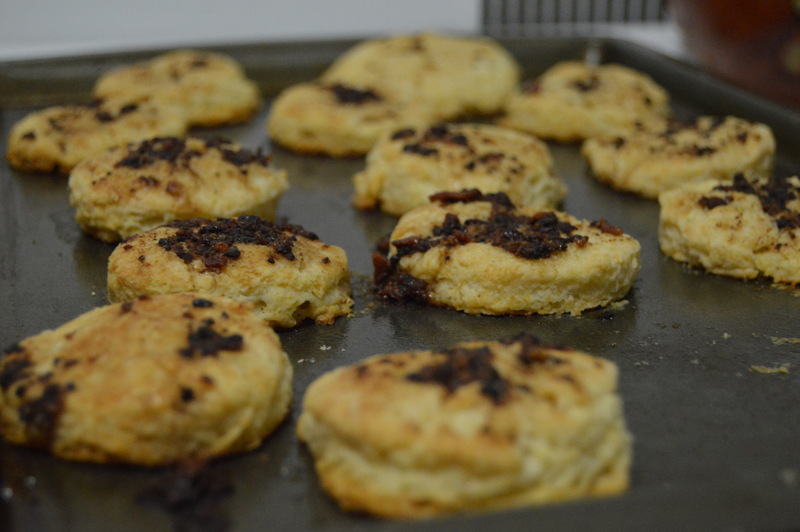 Bacon Maple Biscuits – Make it. Eat it. Love it. For some, bacon and maple sounds like a classic match made it heaven. It is similar to peanut butter and chocolate or buff chick and ranch. It just works. At first, I wasn’t convinced on how good this combination could be. It sounded pretty bizarre, but then I tried it in cookie form, and those were pretty good. This recipe has once and for all sold me on the bacon maple front. Its a classic combination that should be enjoyed and reproduced for centuries to come. This biscuits will just make you happy, they are warm, buttery, flaky, have sweet and salty, basically they have everything you could ever want! Make these for Thanksgiving this year and you will definitely impress everyone!! Then slowly pour the milk into the dry ingredients, mixing just enough to uniformly wet the dry ingredients. Then lay onto a lightly floured surface. Pat the dough down into a 1 inch rectangle and then fold it, pat it down, and repeat 3 more times. Then roll it out to 3/4 in and begin cutting out biscuits. I used a lightly flour wine glass to get the size I wanted. Let these cool in the fridge for 30 minutes or put directly into the oven. To make the glaze cook three pieces of bacon, put them into the food processor to grind them up, then pour in the maple syrup. If you can let this sit for a few minutes that would be ideal. Eat them immediately, but you wont actually be able to resist. Sorry for the terrible quality photos, not my best photography but still an amazing recipe! !